Teeth grinding: Night guards prevent damage. Teeth grinding and jaw clenching – common problems for many people – can damage your teeth permanently if left unchecked. People may start these habits to cope with stress or anxiety. Sometimes it’s caused by an abnormal bite or a sleep disorder. If you do it during the day, staying aware of the habit can help. If you clench or grind your teeth while you sleep, the simple answer is to wear a night guard. Sometimes the symptoms are obvious. You might have a toothache or notice that you’re clenching and grinding throughout the day. Other symptoms are subtle. You might notice that drinking something cold bothers your teeth. Or, you might wake up with a headache, ear pain and wonder why your shoulders and neck feel sore. Some people are unaware they’re grinding and clenching. This happened to me. I started noticing that when I would work out, my jaw would be locked. I exercised so intensely that I didn’t feel how much pressure I was putting on my teeth and my head and neck muscles. Sometimes, people feel little to no symptoms. This is one of the reasons why it’s important to see your dentist regularly. A dentist can always tell during an exam whether you clench or grind. Telltale signs include: flattening, divots, chipping on the edges of teeth and tiny fractures. Grinding and clenching leads to bone loss. Teeth grinding and jaw clenching not only cause pain but can also damage your teeth. The main thing people don’t realize is that the pressure chips away at the tooth structure and leads to bone loss. You can easily fracture your teeth. Night guards protect your teeth and muscles while you sleep. 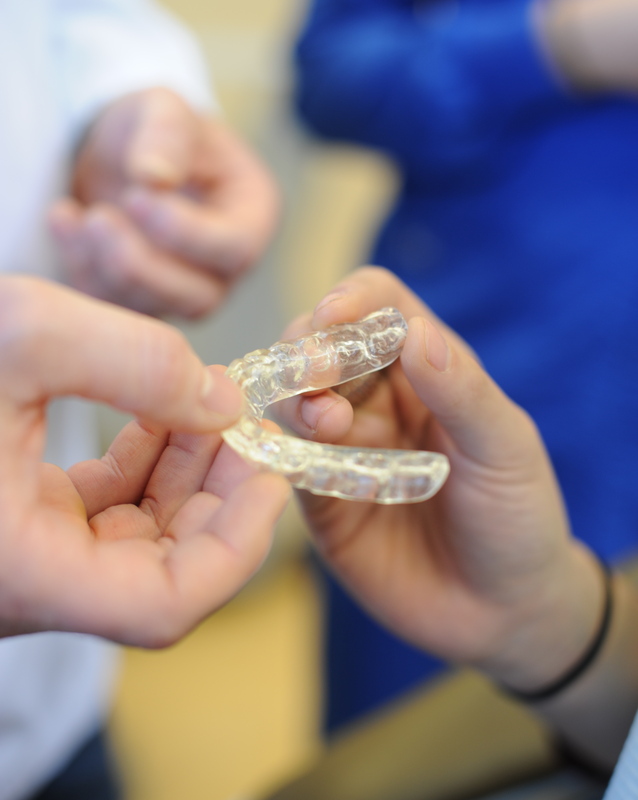 When you wear a night guard, it prevents your top and bottom teeth from hitting each other. It also keeps you from clenching all the way down. Consequently, it gives your muscles some relief and can prevent headaches. Night guards absorb the force from clenching and grinding. Wearing a night guard also relieves the stress around your temporomandibular joint (TMJ). It takes pressure off the joint and surrounding muscles by giving you an even bite across the mouth, which most people don’t naturally have. If your dentist recommends a night guard, it usually takes two visits to make one. During the first visit, we take an impression of your teeth. At the second visit, we fit the guard to your mouth. The more you wear your night guard, the more you get used to it, too. You can also wear it during the day. Dr. Seema Chawla-Miranda practices at Konikoff Dentistry’s Volvo Parkway office in Chesapeake. You can schedule an appointment online or call: (757) 410-9960.